Jack and Sue Drafahl are a husband and wife team of professional undersea journalists, lecturers and multimedia producers. Their articles have appeared in Sport Diver, Skin Diver, Dive Training, Diver, Petersen's Photographic, Rangefinder, Photo Lab Management, Focus on Imaging, Outdoor Photographer, Family Photo, National Geographic World, National Wildlife Federation and Cousteau magazines. Their photos have appeared in a number of books, including Jacques Cousteau, The Ocean World-Abrams Publishing, The Drama of the Oceans-Abrams Publishing, Cousteau, Les Crabes, The Ocean Realm-National Geographic Society, Wildlife of the Oceans-Abrams, Insects of North America-Doubleday, 20 volume series of the Ocean World of Jacques Cousteau-Danbury Press, How Animals See-Facts on File and many more. They have been involved in the digital transition since the early ‘80’s and are software and hardware Beta testers for companies like Adobe, Applied Science Fiction, Corel and Ulead Systems. 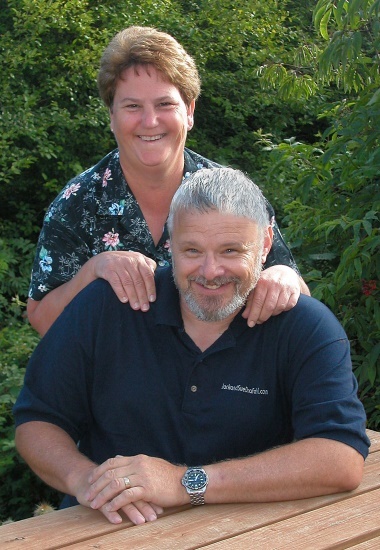 In 2004, Jack and Sue, the Digital Duo, founded the Oregon Coast Digital Center. This enhanced learning facility features personalized Photoshop instruction for a maximum of four students. They have written seven non-fiction books, Digital Imaging For The Underwater Photographer, Master Guide for Digital Underwater Photography, Adobe Photoshop for Underwater Photographers, Photo Salvage with Adobe Photoshop, Advanced Digital Camera Techniques, Step-By-Step Digital Photography and Plug-ins for Photoshop. In 2006, they changed the course of their writing to include fiction. They have three book series: (the Acroname series, the Ship series, and the Time and Space series) that currently include fourteen novels that span the gamut of genres from Adventure/Suspense to Science Fiction. Jack and Sue started their professional photographic careers at Brooks Institute of Photography, Santa Barbara, California. Sue worked as a professional photographer and Jack became an instructor at Brooks and developed the Audio Visual Department. They both received their diving certification in the early '70s and are Platinum Pro 5000 divers(1996). They have enjoyed extensive underwater photography in many parts of the world Southern California Channel Islands, Washington’s Puget Sound, Fiji, Caribbean, Eniwetok, Mexico, Bahamas, Solomon Islands, Hawaii, the Cayman Islands and many other locations. Jack and Sue were awarded Divers of the Year from Beneath the Sea in 1996. Sue is an inaugural member of the Women Divers Hall of Fame (2000) and is an Honorary Trustee. In their quest for new ways to improve underwater, they have two patented inventions. The Light Handle is a unique twin flash system designed to give even flash coverage to super wide and fisheye lenses. The Framer Enhancer is a reflective device designed to reduce the heavy shadows created by a single flash when shooting with the macro framer. Their audiovisual presentations have been shown at underwater film festivals from coast to coast and produce award presentations for the International Scuba Diving Hall of Fame, the Women Divers Hall of Fame and DEMA's Reaching Out Awards. Sharing their hard-earned knowledge about underwater and digital photography, they have conducted seminars worldwide on all aspects of photography, both surface and underwater. Some of these seminars include various diving conferences: Beneath The Sea, Our World Underwater, DEMA and The Scuba Show. In 1980, the Drafahls moved to Portland, Oregon, where Jack worked as an open heart surgery medical photographer. Sue expanded their commercial photography business, Image Concepts, to included clients like Intel, Fujitsu and NEC. In the late 1990's they closed the doors to their commercial photography business to work full time lecturing, writing magazine articles and books. Jack and Sue make their home on the Oregon coast. In addition to their various magazine articles, they enjoy traveling and conducting seminars on all aspects of photography, both topside and underwater.